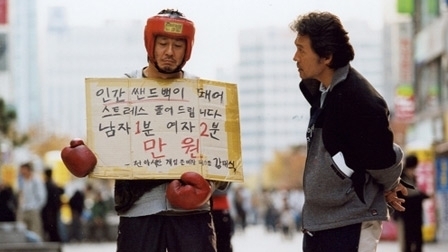 Crying Fist (Jumeogi unda) is written and directed by experienced Korean director - Seung-wan Ryoo. It's worth mentioning that his brother Seung-beom Ryu is playing main role, which is not their first collaboration. A quite talented family. Film tells two separate tragic stories about two man, each of whom are struggling with problems presented by their life's, only common things between them are their failures and boxing, a dying sport in Korea. Other one is adolescent, mean looking Yoo Sang-hwan (Seung-beom Ryu) who always makes trouble. His father tries hard to protect him, but eventually he lands in jail, where he is met by even bigger problems. However, a prison guard invites Yoo Sang-hwan to learn boxing, which he accepts thinking it will help release his anger against this unfair world. Great drama with two strong lead actors, well worth a watch.